How Should a Septic System Work? Buried in your yard and built to last, your home septic system may never have crossed your mind. But out of site and out of mind, it still performs a vital task. It's simple: a tank, a network of pipes, and billions of microscopic organisms. Yet it's received every flush, every shower, and whatever else you and anyone else who's lived in your house has ever poured down the drain. Your septic system treats tonnes of organic waste each season. The tank treats sewage by letting the heavy solid materials settle and allowing time for lighter "scum"to float to the top. This partly treated liquid then flows into perforated pipes, called the leaching bed, where it filters into the ground and is further treated. Helpful bacteria and other soil organisms do the bulk of the work. Even on a proper diet, a septic system still needs regular check-ups. Though a septic tank is designed to store solid materials, these solids build up and limit the settling of particles entering it. And if septic solids are allowed to flow into the drainage field, the field may become clogged. Septic systems work slowly, because the micro-organisms that treat wastewater can only digest so much at a time. 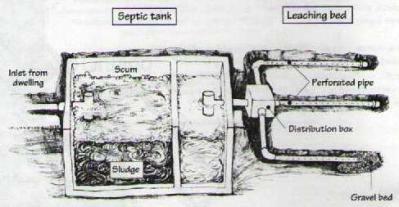 Septic tanks also need some "retention time" for the solids to separate from the liquids. This means that pouring less into your septic system allows it more time to work on each litre of waste, and each litre will be more completely treated. It also means that pushing too much , too quickly through your septic tank can cause untreated solid material to flow into the drainage field, possibly clogging it. Sludge decreases the retention time of your tank - though it appears to be working normally. It might take a year, or it may take five or more, but 'sludge happens'. For Care and Feeding of Your Septic System see: Tom's Tips.